MANILA -- Japan expects to sign a financing agreement to build Metro Manila's first underground mass transit line to help decongest the gridlocked Philippine capital. The Philippines-Japan Joint Committee on Infrastructure Development and Economic Cooperation met in Tokyo earlier this week and agreed to "work closely" together on possible projects. Socioeconomic Planning Secretary Ernesto Pernia revealed separately that the bilateral discussions covered 14 projects, including the central section of the Metro Manila subway project. The 25.3km line will run from Quezon City in northern Metro Manila to Taguig City in the east. The project's estimated cost is 230 billion pesos ($4.6 billion), and this will come in the form of official development assistance from Japan. Feasibility studies should be completed in September in time for the agreement to be signed when Prime Minister Shinzo Abe and President Rodrigo Duterte meet in November at the 31st ASEAN Summit and Related Meetings in Pampanga, central Luzon. Other projects in prospect include a commuter line from Metro Manila to southern Luzon, and a high-speed train from the capital to Clark International Airport and Clark Green City in Pampanga. The projects will cost an estimated $2.7 billion and $1.9 billion respectively. "These are intended to disperse the development away from Metro Manila, which is already suffering from congestion and economies of agglomeration," Pernia said. The projects will be funded from a 1 trillion yen ($9 billion) financial package Abe first announced during his visit to the Philippines in January. 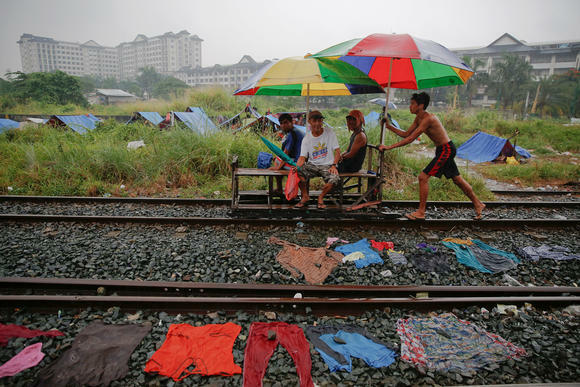 Duterte has promised to increase infrastructure spending during his term, and to decongest the capital and distribute economic growth more equitably in rural areas. This year, he has earmarked 860.7 billion pesos ($17 billion) for spending, which is around 5.4% of gross domestic product. Duterte's six-year tenure runs to 2022. He envisages it as "the golden age" of Philippine infrastructure, and is tapping regional support for his investment initiatives. On Mar. 7, the Philippines and China agreed to resume official economic dialogue after a five-year hiatus caused by their territorial dispute in the South China Sea. Duterte has made a sustained effort to salve bilateral relations with China since he entered office in June 2016. China has already agreed to finance three infrastructure projects: a $3.1 billion railway connecting Manila and southern Luzon; a $374 million dam on Luzon; and a $53.6 million irrigation project on the southern island of Mindanao.